More than a month ago, the seeds of reform in monetary policy began to bear fruit and the cash market began to feel the results of the sound monetary policy applications adopted by the bank two years ago. These successes appeared in monetary stability, recovery of the Iraqi dinar and its appreciation against the dollar exchange rate. Due to Iraq's unstable political, economic and security conditions. 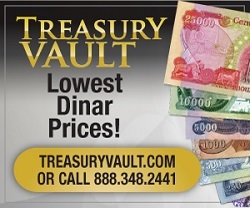 Surprisingly, however, the appreciation of the Iraqi dinar continued despite electoral rivalries, US threats to Syria, a turbulent regional situation and the impact of Turkish and Iranian currencies. which will be reflected on the decline in demand for the dollar in the window selling the currency and the parallel market in addition to the rise in oil prices, And reduces the deficit in the budget of 2018.
and this means that the most prominent reasons for recovery The Iraqi dinar is the plan and procedures of the Central Bank and the cooperation of the banking sector with him and abide by the instructions and standards issued by the Central Bank. and this means that the most prominent reasons for recovery The Iraqi dinar is the plan and procedures of the Central Bank and the cooperation of the banking sector with him and abide by the instructions and standards issued by the Central Bank."